If you build single-family housing developments or manage multi-family properties, installing a mobile sales office at the job site typically makes sense. Unfortunately, traditional office trailers can look dated and reflect poorly on your brand. This is especially true if you sell or rent high-end properties to affluent clients. You may want to consider a portable shipping container sales office instead. Modified shipping containers provide a superior solution and modern take on real estate sales centers. 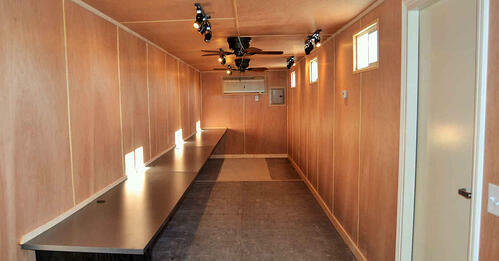 They also provide numerous benefits over traditional office trailers and modular buildings. Another visually appealing and convenient feature of portable container offices is the ground level entry. Shipping containers come with a built-in foundation; absolutely no unsightly skirting, tie-downs, ramps, or steps are required. While good looks are important, the built-in foundation speeds up installation and reduces labor costs. This feature helps save time during the planning stage as well. When you’re ready to have your portable sales office installed, the container can be delivered to the job site with minimal set-up required. Speaking of set up, shipping container real estate sales centers are completely finished out prior to being transported to the job site. All you need to do is connect electricity, water, and sewer and you’re good to go. Modular office containers are an excellent option for anyone looking for a comfortable working environment. Our units are available in multiple configurations to meet a wide variety of workspace, meeting and storage needs. It’s important to note that when you walk into an ISO container office it looks like a modern, professional real estate sales center, complete with painted walls, flooring and enclosed ceiling. You would never know you were inside a shipping container had you entered it blindfolded. You can choose from a variety of container options and floor plans when designing your shipping container sales office. Both our 20-foot and 40-foot container offices come standard with professional office finishes, windows, climate control, electrical hook-ups and lighting. One of the most popular sales office floor plans includes a half bath. Containers with adjacent storage space are also available. 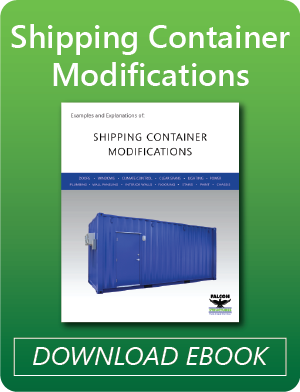 Visit our standard mobile shipping container office page to view floor plans, which can be modified to meet your needs. Constructed of 16-gauge corten steel, shipping container offices offer a level of durability and security that traditional office trailers and modular office buildings just can’t match. Locked containers are nearly impossible to break into, so you can feel confident that your personnel and valuables are safe and secure. In addition, containerized structures offer plenty of long-term flexibility. With an average lifespan of 25 years, easy setup, and inherent mobility, portable sales offices can be easily relocated from job site to job site for years to come. 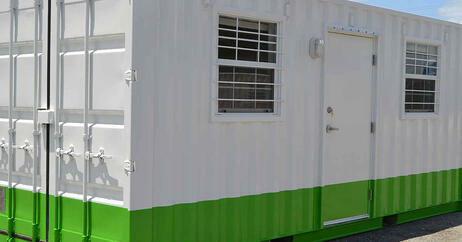 portable shipping container sales offices, give us a call at 877-704-0177.